There has been much discussion over the training of horses when it comes to jumping sports in particular jumps racing in recent times with indirect suggestions that little or no education goes into horses before they are pointed up jumps just prior to trials and ultimately jumps races. This couldn't be further from the truth as I found out when I asked a number of trainers involved in the jumps racing industry. The safety of the horse and indeed its rider is upper most in thoughts and it takes sometime for a horse to go from the very basics to when they are ready to line up in the race. To start there are a number of different techniques used from being in a bullring with very low obstacles and sometimes more than one horse at the same time to encourage the obstacles to be nothing special just an obstacle they need to pick their feet up over when playing with others horses just like they would a log on the ground in a paddock to lunging over a pole then multiple poles or often a combination of these tools. Once horses are happy and thinking about stepping over objects without errors they are then started under saddle in similar fashion to any equestrian horse being taught over trotting poles and then cavallettis and small jumps. 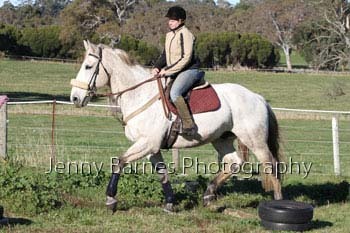 Below are various versions of trot poles with the emphasis on the horse concentrating without getting excited while going over various different set ups with the poles followed by the transition to cavallettis starting with the lower setting and working up to the top as seen in the photos. 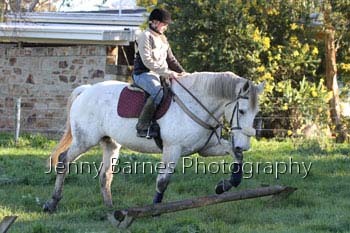 Once the horse is confident over the poles and cavallettis they are then introduced to small jumps in the paddock which can be logs, poles, brush, barrels or any other type of jump to provide a variety of obstacles for the horse to jump. Some trainers also use an older experienced horse to lead another over new jumps so that the novice horse can learn and gain confidence. Amongst the various types of jumps is usually a raceday hurdle which is jumped like another fence in the paddock and most jumps will also be done from both sides. 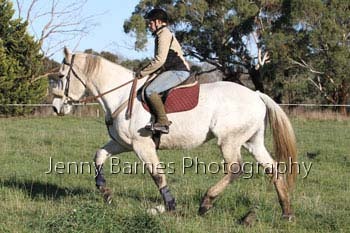 Horses will also be ridden in the same paddock without going near a jump on other days to try and stop the horse becoming excited at the prospect of going jumping. Once they are concentrating on the jumps and jumping well they move on to the bigger jumps and then start to increase speed and eventually graduate to schooling over race hurdles but including sessions over other types of jumps so the horse does not become bored with the whole thing. 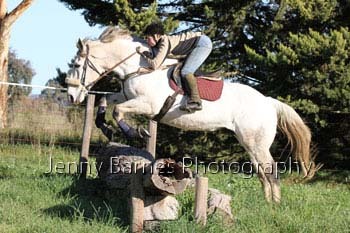 In New Zealand at one course they have a small eventing course for the local pony club inside the racetrack so horses can be schooled over hurdles or taken over the cross country jumps. Horses may have jumped over 500 different jumps by the time they line up for trials depending on how quickly they pick up the correct technique (and horses that pick up a habit of rushing fences will be dropped back in their training until they can calmly take to jumps without getting too excited). In the past horses also use to compete in Point to Points to prepare for official races but these days the closest thing is being taken on a hunt where they can experience jumping at speed in a group so its not a foreign concept once they get to trials and then racedays though not every stable would have access to that sport at the right time. When the horse then lines up for a jumps trial they have a number of conditions they have to pass firstly jumping the obstacles to the satisfaction of the stewards/jumps racing review panel and even the trials have to have a minimum number of runners and jumps. There are also rules about how many trials a horse has to complete successfully before being permitted to race. On raceday the horses are still under scrutiny with every horse assessed by the review panel and if a horse does not jump well on raceday it can be sent back to the trial stage to requalify for permission to race. 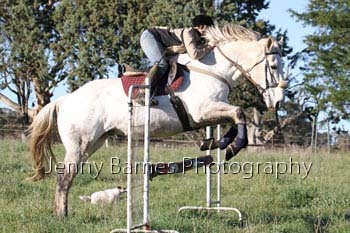 Some horses though show in the early stages that they are not interested in jumping or have a bad technique and of course they are found a different career and its not safe to try to jump a horse that has no ability at the caper however this tends to be in the minority of horses that are tried for a new career. However this is the same in the equestrian world where you will on occasion see ads for a horse that the owner has tried to turn to eventing or showjumping but isn't a jumper so they look for a dressage or hacking home for them. All the photos in this article were taken over jumps used for training horses to jump for hunting and racing - several brush hurdles were also there but were not being used and therefore not set up at the time. 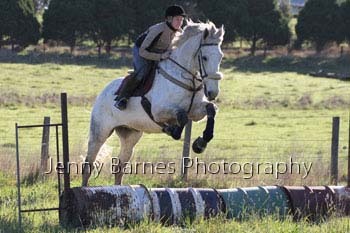 As described in this article horses are thoroughly trained from the basics to jumping various obstacles at speed to prepare for jumps racing and this is done over a number of months as the right grounding and education makes for a safe jumper both for the horse and the jockey who is riding the horse ultimately in a race. They also have the additional skill that they have already been taught to jump for when they move on to pony club, eventing or showjumping after their race career. Very very few jockeys wear spurs these days even in flat racing and their use is very regulated by stewards as is the type they can wear - though with the length of the stirrup jockeys ride at the saddlecloth is an added layer before contact with the horse. Whips are now padded and again while a jockey may ride with the whip on the flat towards the end of the race if you watch carefully most jockeys go back to check and ride their horses hands and heels into a jump to keep the striding right to clear the obstacle. 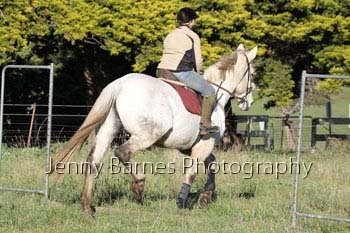 Once balanced on landing they will start whip riding as permitted under the racing rules. 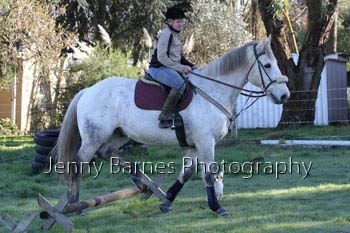 Whips themselves are a lot softer than the whips used in equestrian where they still have the traditional style in use. 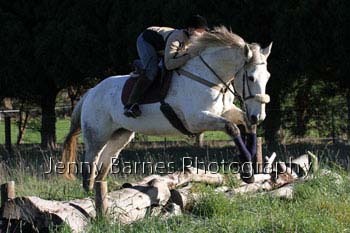 The perfect example of a horse or horses deciding they didn't want to jump was the 1988 SA Grand National Hurdle. Two horses including the well performed jumper Sir Agrifo came to the second last fence on a very wet and boggy track and one horse ran off to the outside of the fence leaving Sir Agrifo all on his own certain of victory and he too decided he'd had enough and swerved out around the last jump as well despite the jockeys efforts to stay on course. Sir Agrifo went on to further success but that day he didn't want to jump so he didn't. This emotional argument forgets that a terrified horse will blind bolt and plow though anything in its path (or try to) - they wont jump obstacles in their path and they will not stand off and measure striding into an obstacle (as seen when Banna Strand lost his rider in the 2011 Grand Annual and proceeded to jump the wing of a fence going up the hill and then measured and jumped the two metre brush fences that attracted world wide attention). Riderless horses also tend to weave in and out jumping and then skipping a fence while continuing on and while some will actually continue to take part and often try to win others will canter along the outside fence looking around taking in the sights. 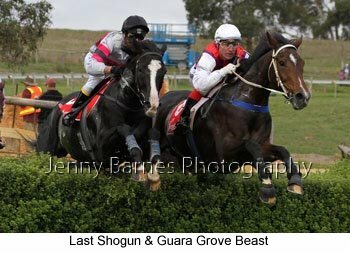 Some may be 'following the herd' at the canter and others may just be finishing the course and then coming back to scale as they have done in previous races. While many horses are tried (and some rejected) as future jumpers the months (even over a year with even the shortest career over the jumps) can give them the extra training and time to mature into better mounts for a second career in equestrian sports it also allows for the horses to move easily into eventing and showjumping instead of having to start with the basic pole work again as a flat race horse would. 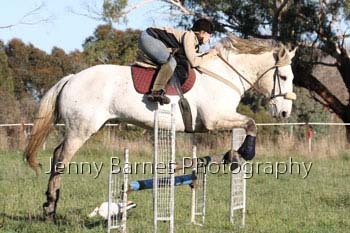 Unfortunately in the early 2000s in Victoria they agreed to the anti jumps activists wishes and replaced the more solid jumps with the soft yellow brush 'modular' fences which the activists believed would make for safer jumps racing. Many involved in racing industry believed that these flimsy small obstacles would encourage too much speed and horses would make errors due to going too fast and basically stride over the obstacle instead of jumping. This observation turned out to be correct and while the overall race times didn't seem to change the way the races were run changed immensely with the fields going at a ridiculous slow canter for the first part of the race and then sprinting at nearly full speed over the last 1000m whereas previously the fields had gone at the same pace throughout til the final 'sprint' for home (which was usually a lot slower than flat horses anyway). Bad accidents increased and the call for the sport to be 'banned' by the activists groups increased yet they had been the ones who pushed for the modular jumps through their spokespersons at various reviews. 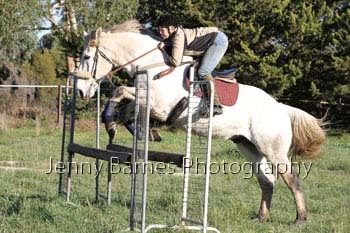 In 2010 Victoria introduced new fences from France and the hurdles started to look like the ones that had been used throughout the 90s (perhaps a tiny bit smaller but far better than the modular yellow jumps). 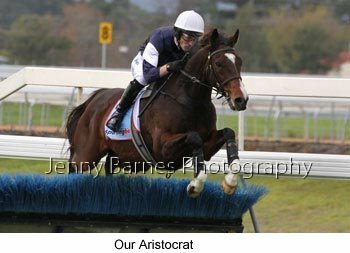 In SA there was a 5 year gap where there was not one fatality (Apr 2003 to May 2008) and few falls in the jumps races however SA kept the same blue hurdles that had been introduced in 2000 and races were run in the old fashion same tempo throughout til the last surge for home usually well after the last jump. 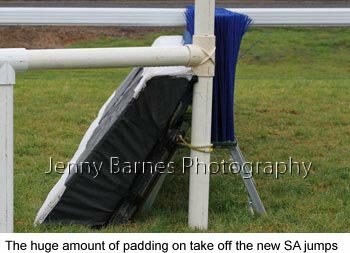 In 2008 SA used the yellow jumps for the last part of the season but switched back to the blue jumps in 2009 with added padding (padding like gym mats are on the takeoff side of the jumps) and white sighter lines to improve safety. 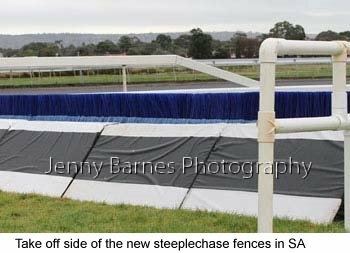 In 2011 SA introduced new steeplechase fences with the bulk of the jump being made up with a huge amount of padding (like a giant gym mat see photos). As for shortening the races over recent years several races were also made shorter such as the VRC Grand National Steeplechase and Australian Steeplechase but many in the industry believe longer races (or simply going back to the longer original distances in races that have been shortened) would result in a slower pace with an emphasis on jumping rather than speed and as mentioned several times there is more risk when horses go too fast over the hurdles something that bigger jumps also helps as they slow down to sight the jumps rather than skip over as they did to the modular obstacles.